Day 4 of TED 2016 started off differently from any days at this or previous TEDs. I attended a Believers' Prayer Breakfast. The organizer found me because on my description I listed Christianity (as well as gadgets and business ethics) as something I would like to talk about with folks. As a Christians this prayer breakfast felt very normal--a couple dozen Christians gathered in a room to spend some time praying and talking. At TED, however, this felt very abnormal, almost subversive. The normal part of the prayer breakfast included praying for the conference, the attendees, and each other. It also included telling stories about seeing the hand of God in our lives, at TED, or wherever. The abnormal part was that I, like many of the others, felt such a relief to find other Christians at TED. Probably joking, a few people mentioned keeping the names of attendees low profile. In fact, I'm reticent to say in this blog who else attended. I'm probably being foolish, but I also don't feel right "outing" someone without asking them first. 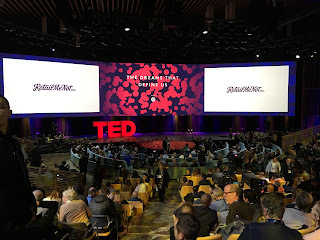 We talked about those shared feelings of being outsiders at TED, though quite probably the vast majority of folks here would be unaware of that and don't intend it to be so. Someone astutely pointed out the parallel feelings many non-Christians feel toward the Church. I greatly enjoyed the time we got to spend together. The first talk of the day was by Arthur Brooks. He spoke compellingly of the need for the Right and the Left to work together. He said this not to encourage folks to remove the current political gridlock, but because the two sides each bring something important to the table. He attributed the dramatic decrease in world poverty over the last decades to the combination of the desire to address poverty from the Left and the reliance on the free market from the Right--neither by itself would have been sufficient. He sees our problems as largely the result of a "lack of visionary servant leadership." He went on to say that it "is not enough to just tolerate those we disagree with." He said that the ultimate level of servant leadership is when the leader "takes it personally when someone insults the other side." I'm hoping to find ways to step up to that kind of leadership. Adam Foss started his talk by asking the audience to raise their hands to answer a few questions. The first couple were about whether folks had ever gotten into a fight, shoplifted, or tried illegal drugs. Pretty much all of the hands in the auditorium were raised. He then asked how many folks had spent even one day in prison. Only a smattering of hands went up. Foss then spoke of his work as a District Attorney. He told of how he has worked to find alternatives to prison and felony convictions that punish, but cost society greatly. He described one situation where a kid stole 30 laptops from Best Buy and tried to sell them on eBay. Rather than having him thrown in jail, he found a way for the teenager to return the unsold ones, pay back the other ones over time, and do community service. Six years later Foss ran into the teenager who had gone to college and now worked as a bank manager. John Legend, accompanied only by himself on the piano, sang a couple beautiful songs closely tied to Foss' talk. He sang Marvin Gaye's What's Going On which includes lines like, "Brother, brother, brother, there's too many of you dying." He followed that with Bob Marley's Redemption Song. Both songs were very powerful and spot on message. Moran Cerf is a neuroscientist and former hacker who has done some fascinating (and scary) research on both recording and modifying dreams. He talked about the potential of using his research and techniques to reprogram folks while they are asleep to enhance their sleep or change their behavior, such as reducing smoking cravings. He is currently working with PTSD patients to try and remove some of their symptoms. It really left me wondering what I thought about such techniques. His talk is definitely one I need to think more about. There were two talks during the day that showed off the power and potential of virtual reality. The first was a demo of the Microsoft HoloLens by Alex Kipman. It is a bit hard to describe exactly how this works in just a few words, so I'll stick to what we saw. First, there was lots of the usual amazing scenery and such that he walked through and interacted with. He then demoed a video conference where a hologram of someone from NASA was with him on the stage. There was definitely a bit of lag and some glitches, but it looked very promising. The best illustration of the technology's power was after the talk when the person curating the session came on stage to ask a couple questions to Kipman. Behind her, the person from NASA's hologram returned. The curator was both startled and rather freaked out by it. Chris Milk makes virtual reality movies. In order for the audience to experience a bit of them, the TED staff had folks download a special app from VRSE. On every seat in the auditorium, there was a Google Cardboard and a pair of headphones. Google Cardboard is just a cardboard box with a pair of lenses in it (those of you who are old enough, think View-Master) with a space in the back for you to slip in your smartphone. You can buy one of these for $20. The really cool part of this was that the app played the VR video for all of us at the same time. 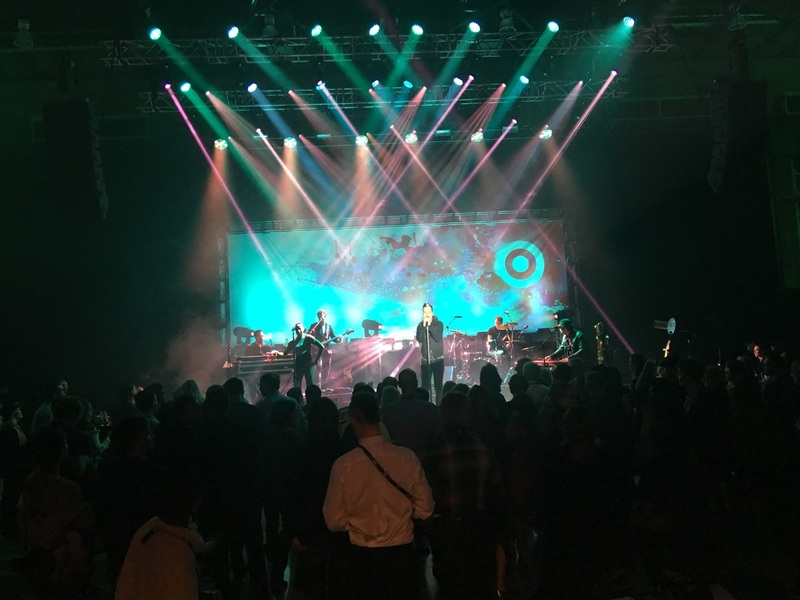 Over 1,000 people were all standing up, turning around, bumping into each other, and reveling in this VR experience. No written description can do this justice, but at one point there was a woman standing very close in the video. It really felt so much like her being there such that it was a bit uncomfortable for someone like me who is not a big fan of close talkers! The technology will only get better, but I would encourage you to try it out now. There were quite a few other interesting and informative talks, but none of them matched the caliber of Day 3. Lidia Yuknavitch spoke of being a misfit (which made me realize that the spectrum of misfits goes WAY beyond me). Mariano Sigman told about his work using big data, word proximity, and ancient texts to analyze the emergence of concepts like introspection. Kang Lee described his research on lying and how it is possible to use "transdermal optical imaging" to detect lying. He hinted that it would be possible to detect the heart rate, stress level, and, possibly, whether the person is lying from video of a presidential debate. That is a debate I would watch! Dinner was a party with the typical small plates and confusing food. I managed to eat plenty despite those limitations. 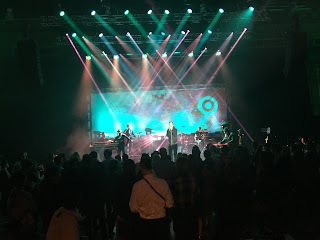 The band Fitz and The Tantrums played and folks seemed to know their music and enjoy them. I talked to a few interesting folks, including someone who was retired, but keeps busy by working with the Super Bowl Committee (I really don't know what that means he does) and some venture capital guy who had started Friendster and sold a subsequent start up for $1B. Just another typical TED folks and day!